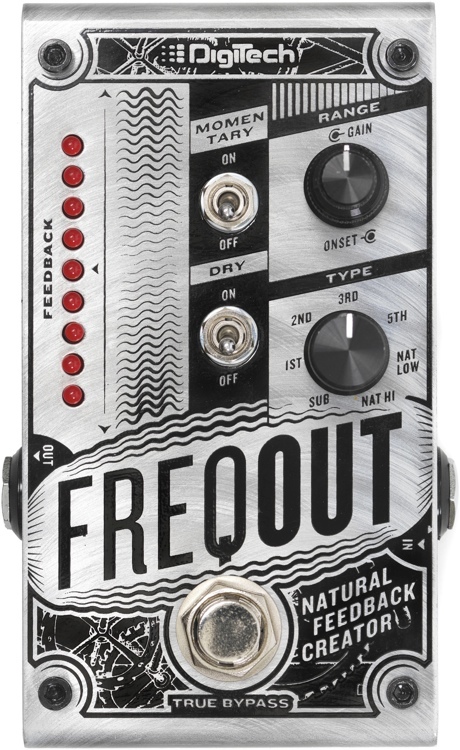 While I was at NAMM 17 this year, the big buzz that people were talking about in the pedal world, was the Digitech Freqout pedal. This pedal simulates/creates natural feedback at low volumes. When I heard that, I was surprised that something like this was not already around. There has been the ‘sustainiac’ in guitars for years (which I’m assuming is similar but could be totally wrong). Basically, the pedal can create feedback in either latching mode or controlled by long press on the footswitch. I have to admit, at first, I thought it was a one-trick pony and couldn’t see the potential. But after seeing various demos, I see why people are getting excited. When I look more closely, it’s the control that I like. Onset delay and gain are great to adjust when the sustain occurs and how much gain it will have. Then there is type which gives you 7 harmonic types (Sub, 1st, 2nd, 3rd, 5th, Nat Low and Nat Hi). There is a Momentary on/off which is the latching mode that I mentioned above. And finally, the Dry on/off. This will eliminate the dry signal from the feed back if off. So pure feedback and nothing but the feedback if it’s set to on. Typically, you can use this for getting that sweet feedback on the sustained notes – but at low volume. That’s the meat of it. But immediately, I was hearing some other great techniques to make some unusual tones. I can’t want to hear what some of the non-traditionalist shoegazers are going to do. One aspect that I liked is the simulated e-bow effect. Or the ability to almost add ‘shimmer’ top note. Cool stuff. Now, the Digitech Freqout Natural Feedback Creator is not out, but you can pre-order it through Musician’s Friend. They are expecting a ship date of 4/11 so not too far away. You can pre-order this for only $179.95, which is pretty great price. When you get yours and give it a spin, I would love to hear what you think about it, and how your are using it!